The Cypriot way of eating: Meze – Mezze » Meze, George, Everything, Cyprus, Typical, Trying » tobias cooks! The Cypriots are proud of their food and their way of eating. Typical for Cyprus as many countries in the region is the Meze. In Cyprus the Meze is not considered a starter at all. Meze is rather an evening filling meal. 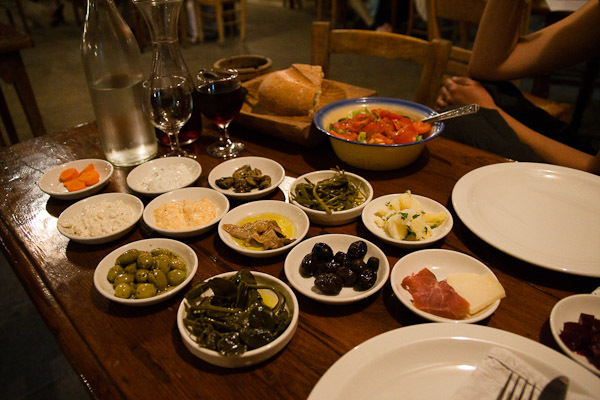 A good choice of Meze, served in the right way you can find at the 7 St. Georges Tavern. The philosophy of the place is to create a simple, cozy and authentic setting. Serving Meze the slow way, dishes cooked form home grown produce. Organic farming, of course. There is nothing to order here besides the drinks. You can choose form self made red or white or a very nice Tsivania. The food comes without ordering and won’t stop coming until you say so. It all starts with a fresh salad, pickled vegetables and capers and olives. The bread is freshly baked. Everything is so fresh, its simply great. Everything is served in small bowls and dishes. Once they are emptied new ones are brought. Chicken cooked in cream, Lamb with lentils, roast beef with chutney… a perfect way of spending an evening. Meze is not so much about what you eat but how you eat. Trying a large variety, but small quantity. The tavern was opened by George and his wife Lara in 1996. It is now tun by George and his son Ben, who will take care that you have a great evening. 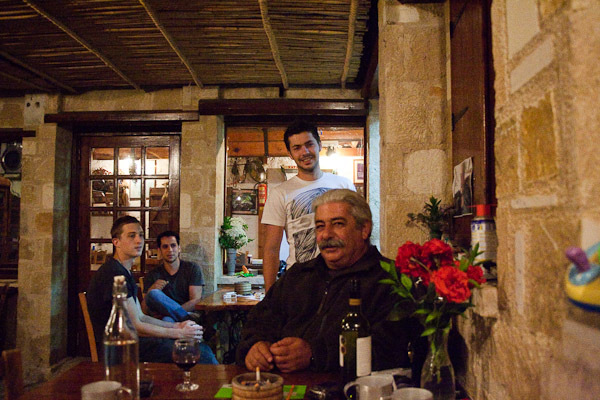 You can find this gastronomic gem in Yeroskepos near Paphos. Certainly worth a visit. Make sure you book, the place fills up easily! I like the “set menu” offerings at Cypriot menus…order a different menu each time! Sounds like a wonderful restaurant worth visiting. Really, this is cruel. I wish I was in Cyprus so bad now!! Fantastic description. I love your posts about Cyprus and the curiosities you are showing to us. I ave many friends from Cyprus and have veyr much wanted to visit there the last few years. Perhaps in the near future we will get to do so. And perhaps we will visit this wonderful taverna which sounds absolutely amazing! How fun! It is so neat to see all these similarities and differences in our two countries. Definitely one of the best restaurants/taverns in Paphos. The food is the best quality, the best amount and great value. The wine is hoemmade organic and too easy to drink! The puddings are a delight, especially the banana cake so leave room. Best enjoyed socially with friends/family over a few hours. Ask your friendly hosts George, Ben or Damian to take their time with the dishes for the best experience. The atmosphere is great, day or night and you cant help but go back again and again. Log in | 73 queries. 0.482 seconds.